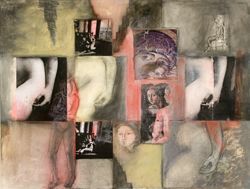 I am a mixed-media painter using collage on paper and wood panels, which deal with the human female figure and identity. My work is art about art and relies on images from art history especially the Venus figure from Botticelli’s, Birth of Venus, and Titian’s Venus and the Cappadocia Virginfrom early Christian art in Turkey. I am continuously concerned with dualities and opposites: inside-outside, surface-interior, positive-negative, appearance-identity and concrete-spiritual. 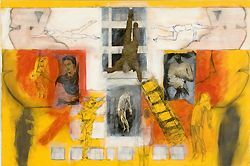 Mary Maughelli was a painter involved in using photo collage and was an exhibiting and producing artist for more than 50 years. She showed her work locally in Fresno as well as at AIR Gallery in New York for 14 years, the most recent being a 2007 exhibition titled Wish You Were Here VI. Maughelli was invited by Judy Chicago, with whom she taught at Fresno State College (now California State University, Fresno), to show in the opening exhibition at Womanspace in Los Angeles. 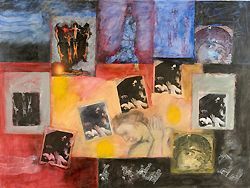 She also exhibited her work at the Woman’s Building in Los Angeles in the 70’s and late 80’s. She was a member of the Southern California Women’s Caucus for Art for numerous years and was included in Curator’s Choice, (2005) at The Brewery in Los Angeles and Female, Feminine, Feminist (2003) at the Orlando Gallery in Tarzana, CA. Maughelli was a Professor Emerita of Art from California State University, Fresno where she taught for 36 years. She was also a Fulbright Fellowship recipient who was granted two years of painting in Florence, Italy after she completed her MA at the University of California, Berkeley in 1959. She was included in the prestigious book California Society of Printmakers: One Hundred Years, 1913-2013. Mary Maughelli (1936-2015) is a legacy member of the Artist Registry.